Nicaragua Cichlids like to be kept in groups, so they need a large tank with a lot of hiding places made out of wood or rock. They prefer very fine gravel or sand substrate for digging, and can be housed with hardy plants. Nicaragua cichlids are fairly easy to care for, but with their large size and occasional territorial nature they may not make such a great choice for the beginner. Ominvore; Will accept a variety of foods including flakes and pellets. Diet should be supplemented with live, fresh or frozen foods. Breeding can be difficult, as it is sometimes hard to find a compatible pair. Eggs are laid in a large pit in the substrate, usually dug under a rock or in a cave. Eggs hatch in 3 days and are closely guarded and reared by both parents. Relatively peaceful for a Central American cichlid of this size, but is still territorial and obviously grows quite large. Best kept as a mated pair. If you want to keep any other cichlids in the tank, you will probably need one at least 6 feet in length. Do not combine it with any super aggressive species. Other possible tankmates can include larger barbs and characins, catfish and Loricariids. 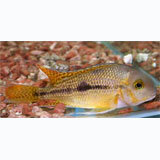 A great alternative to more aggressive large new world cichlids, popular because of their stunning colours and nice disposition. They make a wonderful species tank in a large group. This is the only SA/CA cichlid that does not have adhesive eggs. As stated in the breeding section, this fish lays their eggs in a pit or deep crevice of a rock.